Please keep in mind that tasting appointments are for large events only. The minimum order for a complimentary wedding cake tasting is $275.00. Do you use Fondant? We do not use fondant or any other rolled icings! We get that same smooth look by using specially honed techniques with our white chocolate mousse frosting. This way your cake not only looks great but it tastes even better! Do you offer fake cakes? No. In the end purchasing a fake cake costs the same as a real cake and we would much rather give you a real cake than styro-foam. Do you deliver? Yes. We deliver and set up all over the twin cities and beyond! Can I pick up my wedding cake? Absolutely. If you are on a budget or have a wedding out-of-town and are traveling our cakes our perfect for your event. They come in separate boxes with pillars and plates already to go! So you simply have to stack one on top of the other. Do you charge for tasting appointments? No. Our consultations are 100% free! At your tasting you will be trying our 8 most popular flavors. Please keep in mind that tasting appointments are for large events only and minimum of a 2 tier cake is requested. How long do tasting appointments take? We schedule one hour for your consultation. Typically tastings do not take that long, but we want to make sure that we have time to capture the vision of your ideal dessert! Do you offer weekend tasting appointments? Yes, we do Saturday and Sunday appointments in St. Paul and Minnetonka. How many people should I bring to my tasting appointment? Space is limited in our show rooms, so we ask that you keep the number of guests at your tasting to a maximum of 5. What should I bring to my tasting appointment? Feel free to bring in ideas for your cake! Color swatches, invitations, pictures, etc., this will help us get to know you and your event so that we may design the perfect cake for you. Do you have gluten free options? We do have a non gluten options. We have flourless chocolate torte, variety of cake and cupcakes flavors. Samples are available upon advanced request. If you have any allergies let us know! We will be happy to go over our ingredients lists with you. We do use nuts and other allergens at our Bakery. What are some non-traditional wedding cake flavors? Be adventurous with your wedding cake! 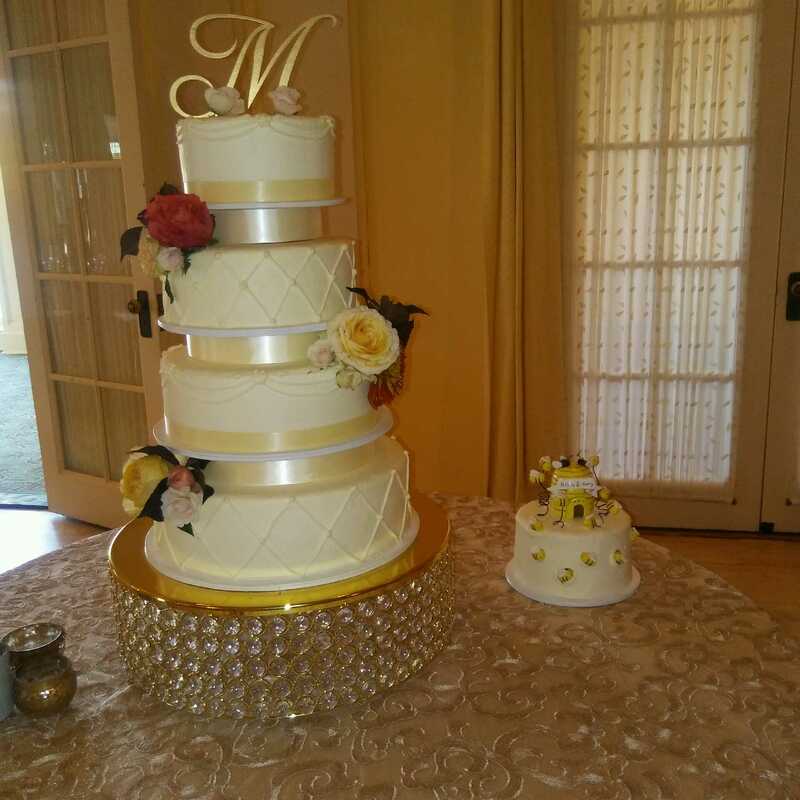 We offer cheese cakes, specialty cakes, and mini desserts to be served as your wedding cake. Samples are available upon request prior to tasting. When should I place my order? For a large event or wedding, we recommend ordering 3-6 months prior to your event. However, if you don’t fit in this timeline we can still accommodate you! For retail and special occasion cakes we prefer 3 days’ notice. Should we freeze our top tier? Buttercream offers a small complimentary cake on your first year anniversary. So you can count your top tier in your servings and have a fresh delicious cake to celebrate with! Make sure you give us a call a couple days before your 1st anniversary to redeem this offer! Do you sell toppers? We do not. However, at your tasting, ask your consultant about helpful tips and information on where to get cake accessories. Do you have any cake stands? Yes! Buttercream has a wide range of cake stands to rent. Ask your consultant for details. Do I have to order one of the cakes from your portfolio? Absolutely not. All of our wedding cakes are individually designed. You may certainly order a cake from our showroom, portfolio, or signature collection but they are to show you what we do best and serve as inspiration for your custom wedding cake.